This post comes with a heavy heart as I fear the worst. After a long night working the 400-person gala I produced on Saturday, I came home to discover that my sweet 12-year-old white cat, Snowball, had become deathly ill. My cousin, who is caring for my two kitties, took her to the ER vet where they began trying to stabilize her. It seems she has developed diabetes over the past few months (or might have always had it) but has taken a downhill turn more recently. Her little body is wasted away to skin and bones - not something that happens overnight and that I wished I had known sooner. She is still at the vet and her glucose levels have improved but she still isn't eating and her white blood cell count is alarmingly high. They've got an IV hooked up to her to continue to get her hydrated and I can only hope and pray that she starts eating soon to gain her strength. I feel a recovery might be quite possible if that can happen. If it doesn't, she will become too weak to survive. 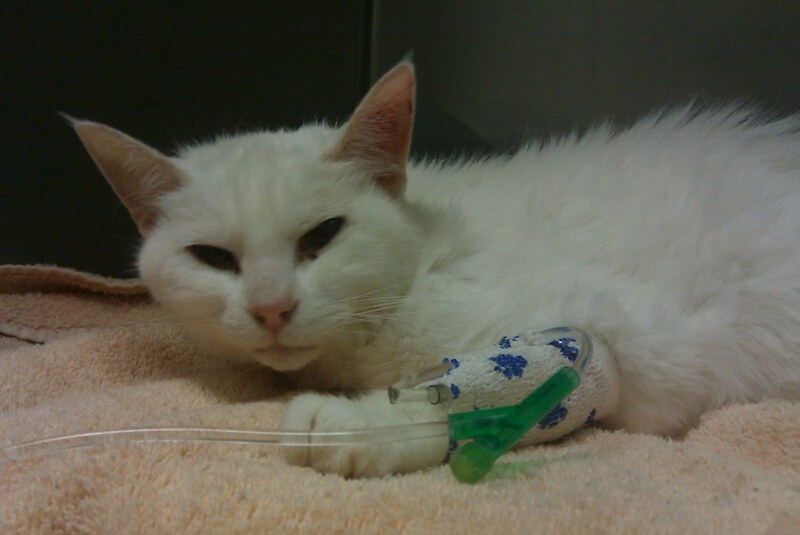 MY POOR BABY SNOWBALL AT THE VET, SHE IS STILL VERY WEAK. I'm in angst because I don't want her to suffer and I know putting her to sleep will need to be an option if she doesn't improve. But how long do I wait? Nursing such a sick creature back to health can take awhile, so I don't want to decide too soon. She's being transferred to the regular vet office Tuesday morning and I will wait to see what they say as well. Far as I know, the doctors have been taking excellent care of her and have been very kind in giving me detailed updates when I call to check in. Mike and I are leaving for Italy on Friday and I'm torn because I want to be sure she is okay, but we're gone for 10 days and it will be even harder to check on her during that time. 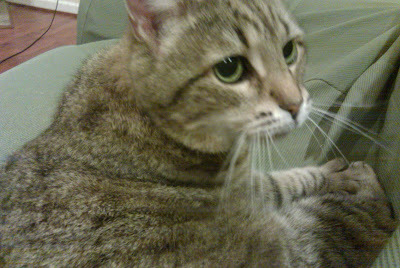 But if she is in the vet's care, perhaps it will be a long enough period to truly decide whether or not she can recover. And I do want to be able to enjoy this trip - it's one in a lifetime. But it's just so hard. Some of you may think this is a lot to go through for a cat, and I agree. But I am beyond attached to these two critters, they have meant as much to me as a pet can mean to anyone. My two cats have been there with me nearly my whole life. Snowball is part-persian with large pinks ears and big blue eyes, and she's been a healthy 12-year-old up to this point. July is my 17-year-old mackerel tabby who was just put on thyroid medication and is now doing better than ever. JULY LOUNGING AT MY COUSIN'S HOUSE. They grew up with me as a child (I got them when I was 7 and 12, respectively) and they've made every move with me from city to city. When I was lonely in a new apartment or a bit nervous starting a new chapter in my life or entering a new university without knowing a soul on campus, those kitties were my constant. They slept on my bed every single night and still follow me around the house whenever I'm home. Normally, when we moved into a new place, they were always a bit timid and shy before deciding it was okay to venture out of their cat beds and explore. Snowball always went straight for the fireplace, she liked hiding in the dark black hole while boxes were moved in. But unfortunately it always turned her into a gray furry mess by the end of the day. Then I'd have to pry her out and put her in the tub to wash her clean. The oddest part was that water didn't bother her and she'd sit there calmly while I bathed her. July, on the other hand, is a crabby old woman and doesn't prefer the bathtub one bit. When we moved to our new house in Katy, they seemed to take an instant liking to the place. There was no hesitation, before we'd even unloaded the first set of boxes they had made themselves right at home, sprawled out in the middle of the living room floor as they observed our hard work. It was the one place they seemed to love right away, and so did we. It was exceptionally hard to leave Snowball and July behind (as well as our two dogs, Shiner and Jersey) as we set abroad for an entire year. I have been nervous since before we got on the plane that something would happen, since both cats are quite aged. I just figured July would be the first to experience any problems so it never crossed my mind that Snowball could become ill. I am praying every day that she can make a recovery and that God would allow me to keep this loving creature for a few more years. It is so very difficult to be thousands of miles away and unable to care for her myself. I am indebted to my cousin for taking the time to make vet runs and feed them their medications. I just wish I could be there, wish I could take care of everything so someone else wasn't being put through this. But I've been up till 3am the past two nights researching possible conditions, treatments for diabetes and calling the vet for updates. I can only hope for the best, and prepare for the worst. I am so sorry for the pain you are going through! Loss is always hard....but more so when you are so far away. Snowball has had a wonderful time in Alabama....this would have happened even if you had her at home in Katy. Please don't beat yourself up! I know you will make the right decision when the time comes. My prayer is for peace in your heart as you decide.